We’re heading in to week two of end of year awarding, and now it’s my turn. One of the critics groups I’m a member of has handed out their awards, and of course nothing I voted for won. That’s likely because I am the only critic on planet Earth not voting for Brokeback Mountain. The cowboy love story that doesn’t know how to end has picked up another seal of approval on its way to being nominated for, and no doubt winning a big pile of Oscars. So the Dallas-Fort Worth Film Critics Association joins the long list of groups handing Brokeback Mountain an award for Best Picture, and the DFWFCA gives Ang Lee a Best Director prize as well. Meanwhile Capote dominates the DFWFCA’s acting category with wins for Philip Seymour Hoffman and Catherine Keener. Felcity Huffman’s gender bender Transamerica earned her a Best Actress award, and one of my favorites of the year, Crash, earned Matt Dillon a Best Supporting Actor nod. 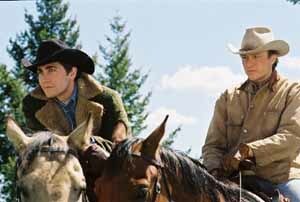 The Dallas-Fort Worth Film Critics Association voted the frontier romance BROKEBACK MOUNTAIN as the best film of 2005, according to the results of its 12th annual critics’ poll released today. Rounding out the composite list of the top 10 films of the year were CAPOTE (2), GOOD NIGHT AND GOOD LUCK (3), CRASH (4), CINDERELLA MAN (5), SYRIANA (6), PRIDE AND PREJUDICE (7), A HISTORY OF VIOLENCE (8), KING KONG (9) and THE THREE BURIALS OF MELQUIADES ESTRADA (10). For Best Actor, the association named Philip Seymour Hoffman for CAPOTE. Runners-up included Heath Ledger for BROKEBACK MOUNTAIN (2), David Strathairn for GOOD NIGHT AND GOOD LUCK (3), Joaquin Phoenix for WALK THE LINE (4) and Russell Crowe for CINDERELLA MAN (5). Felicity Huffman was voted Best Actress for TRANSAMERICA. Next in the voting were Keira Knightley for PRIDE AND PREJUDICE (2), Reese Witherspoon for WALK THE LINE (3), Joan Allen for THE UPSIDE OF ANGER (4) and Charlize Theron for NORTH COUNTRY (5). In the Best Supporting Actor category, the winner was Matt Dillon for CRASH. He was followed by Paul Giamatti for CINDERELLA MAN (2), Jake Gyllenhaal for BROKEBACK MOUNTAIN (3), George Clooney for SYRIANA (4) and Jesse Eisenberg for THE SQUID AND THE WHALE (5). For Best Supporting Actress, the association named Catherine Keener for CAPOTE. Runners-up included Michelle Williams for BROKEBACK MOUNTAIN (2), Rachel Weisz for THE CONSTANT GARDENER (3), Scarlett Johansson for MATCH POINT (4) and Amy Adams for JUNEBUG (5). Ang Lee was voted Best Director for BROKEBACK MOUNTAIN. Next in the voting were George Clooney for GOOD NIGHT AND GOOD LUCK (2), Bennett Miller for CAPOTE (3), Peter Jackson for KING KONG (4) and Paul Haggis for CRASH (5). The association voted PARADISE NOW as the best foreign-language film of the year. Runners-up were KUNG FU HUSTLE (2), DOWNFALL (3), NOBODY KNOWS (4) and BALZAC AND THE LITTLE CHINESE SEAMSTRESS (5). MURDERBALL won for Best Documentary over MARCH OF THE PENGUINS (2), GRIZZLY MAN (3), ENRON: THE SMARTEST GUYS IN THE ROOM (4) and MAD HOT BALLROOM (5). WALLACE AND GROMIT: THE CURSE OF THE WERE-RABBIT was named the best animated film of 2003, with CORPSE BRIDE as runner-up. The award for Best Cinematography went to Rodrigo Prieto for BROKEBACK MOUNTAIN, followed by Emmanuel Lubezki for THE NEW WORLD. Larry McMurtry and Diana Ossana won the Best Screenplay award for BROKEBACK MOUNTAIN over Dan Futterman for CAPOTE. The association voted ME AND YOU AND EVERYONE WE KNOW as the winner of the Russell Smith Award, named for the late Dallas Morning News film critic. The honor is given annually to the best low-budget or cutting-edge independent film. The Dallas-Fort Worth Film Critics Association consists of 33 broadcast, print and online journalists from throughout North Texas.